How can you make a yummy treat even better? 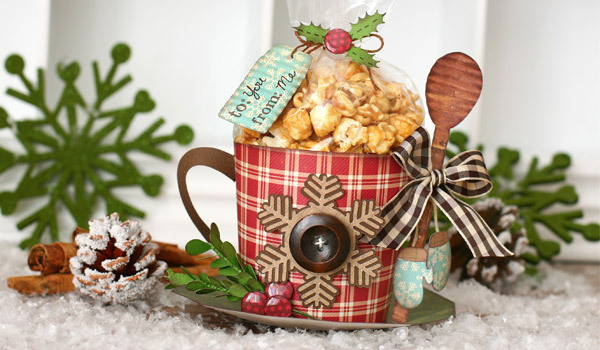 Give it in a stylish way like this adorable mug I've created! It's sure to bring some holiday cheer! Using plaid paper, cut pail.svg at 11.598”w. After I resized I ’broke apart’ and removed everything but the pail and base circles, including the ’holes’ for the handle. Assemble pail and ink edges. Cut saucer.svg with some green holly print paper. I chose not to add any panel pieces to it and it’s still plenty sturdy for this project. Assemble and ink edges. Then, using hot glue, adhere the ’cup’ to the center of the saucer. Open the pitcher1.svg file and resize to 10.25”w. Break apart the files and removed everything but the pitcher handle. Cut. Adhere to the left side of the cup. Cup the wood.svg file (spoon). Run through a paper crimper (or emboss) and ink edges. 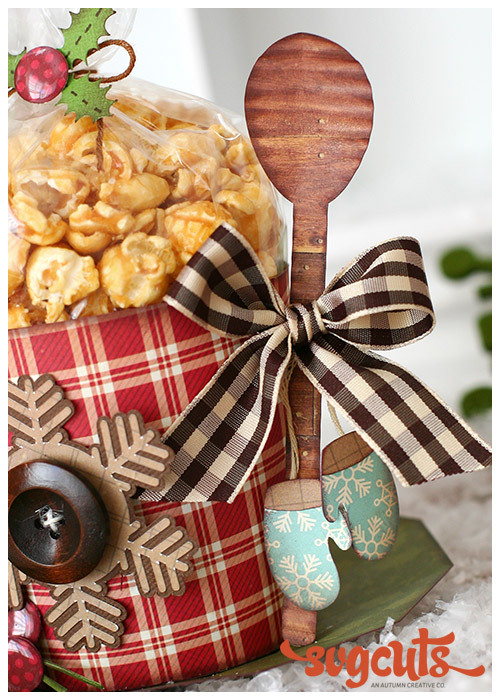 Using hot glue, adhere a brown and cream gingham bow near the top of the spoon. Then, adhere the side of the bow onto the right side of the cup. 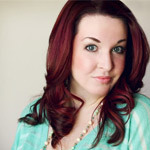 When you open the mitten.svg file from the ’Shaped Cards’ kit, you’ll want to ’break apart’ before resizing to 1.25”w. Cut a pair (make sure you ’flip’ one, especially when using patterned paper). Lightly ink edges and adhere to tan embroidery thread. Using a small dab of hot glue, adhere under the bow. Cut the flake1.svg top and bottom. Adhere to the front of the mug and add a big wood button. Cut two boxwoods. One will be cut at 7.747”w and the other will be cut at 6.00”w. Assemble and then ink edges in brown. Adhere to the saucer/base of cup. Using an Epiphany Crafts shape tool, create 3 small round epoxy ’berries’ and adhere with hot glue to form a ’cluster’. If you are using a bag inside the cup, tie it with a pretty ribbon or embroidery thread like I did and add a tag using the tag_bottom.svg. To get the shape I wanted, I opened the tag and then broke apart the file. Select the tag and then UNCHECK the ’keep proportions’ box and resize to 2.00”w and 1.25”h. Ink edges and stamp. Emboss with the paper crimper (or embossing folder of your choice). Attach to treat bag. Cut a small holly at 1.50”w from the 3D Wintergreens kit and adhere to the bag. Finish embellishing with another round Epiphany Crafts shape for a ’berry’. I chose a kinda country Christmas theme for my project. Switch it up and design it to fit your style! Like hot pink and lime green for Christmas? Have at it! Prefer a more ’wintery’ feel for hot cocoa and marshmallows? Perfect! There’s so many ways you can decorate this for your occasion. I used my paper crimping tool to add texture. This is an ’older’ tool, but I do love the corrugated look you get from it. Adding ink to anything ’embossed’ helps the texture stand out even more. Inking edges in grey or dark brown gives a more ’worn’ ’vintagey’ which I just love! 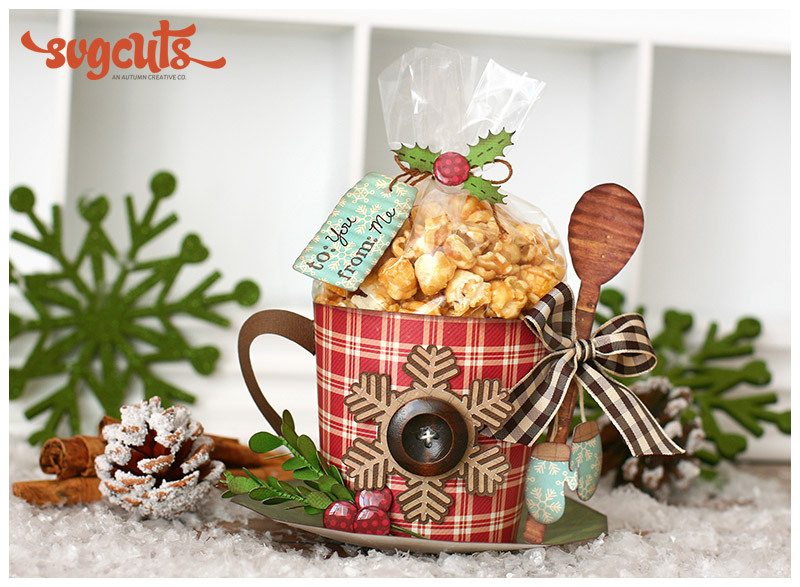 Types of goodies that would look great in this ’mug’ are popcorn, a stack of cookies, a small loaf of bread, fudge, hot cocoa ’kit’, etc. Or just add a cozy pair of socks and mittens if you don’t want to give a food treat. I truly hope you've enjoyed this project and are already thinking of ways to make it your own! 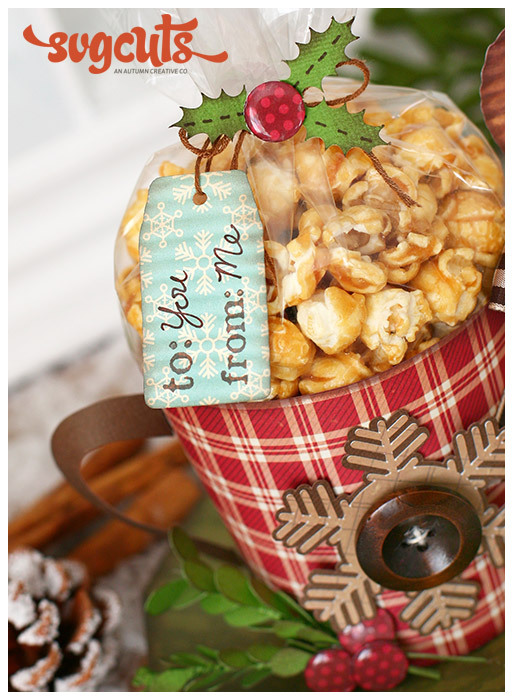 I am ALWAYS giving treats around the holidays so this is perfect for someone like me. It also makes an adorable decoration once the ’goodies’ are gone. 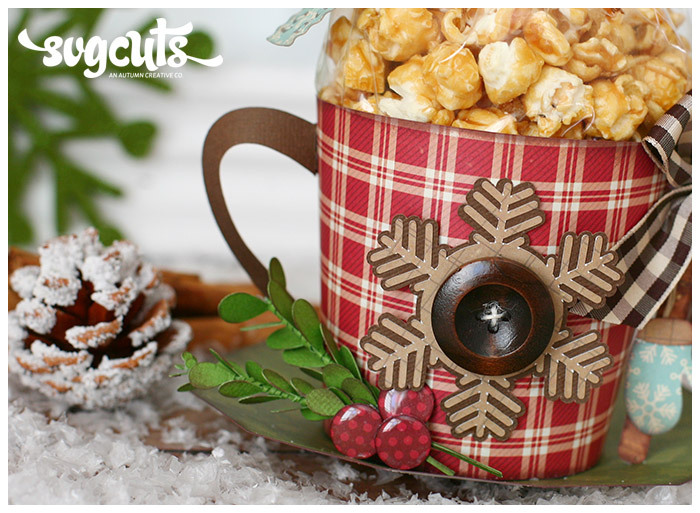 Enjoy and if you make one, we’d love to see you share it on the SVG Cuts Facebook page! I had to stop by and say that this is absolutely stunning!!! I am in love with everything you picked to put this together. I am new to SVG cuts and I want everything!! Seeing this just made my list longer!! !